History: At 9:22 a.m. (local time) on February 15, 2013, a bright fireball was seen by numerous residents in parts of the Kurgan, Tyumen, Ekaterinburg and Chelyabinsk districts. Images of the fireball were captured by many video cameras, especially in Chelyabinsk. Residents of the Chelyabinsk district heard the sound of a large explosion. The impact wave destroyed many windows in Chelyabinsk and surrounding cities. Many people were wounded by glass fragments. A part of the roof and a wall of a zinc plant and a stadium in Chelyabinsk were also damaged. Numerous (thousands) stones fell as a shower around Pervomaiskoe, Deputatsky and Yemanzhelinka villages ~40 km S of Chelyabinsk. The meteorite pieces were recovered and collected out of snow by local people immediately after the explosion. The snow cover was about 0.7 m deep. The falling stones formed holes surrounded by firm snow. Largest stones reached the frozen soil. A stone may have broken the ice of Chebarkul Lake, located 70 km W of Chelyabinsk. Small meteorite fragments were found around the 8 m hole in the ice but divers did not find any stones on the lake bottom. 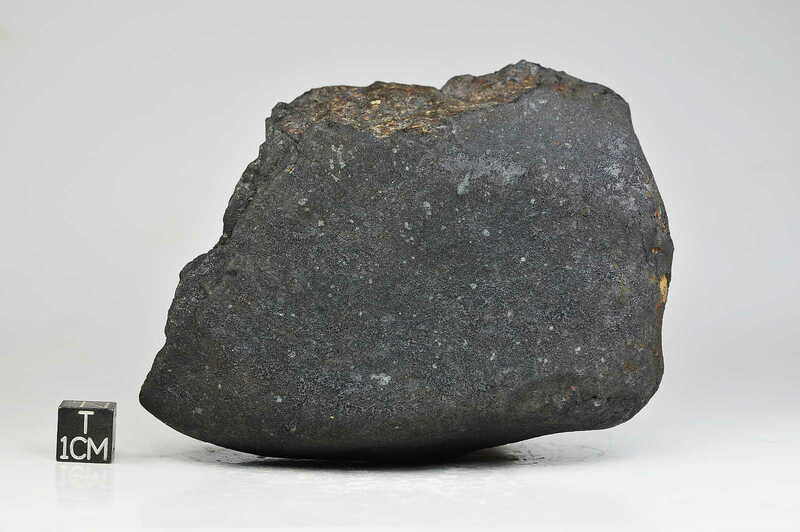 Physical characteristics: The meteorite stones and fragments are from <1 g to 1.8 kg in weight and from a few mm to 10 cm (mainly 3-6 cm) in size. The total mass collected by local people is certainly >100 kg and perhaps > 500 kg. Fusion crusted stones are common. The fusion crust is black or brown and fresh. Broken fragments are rare. The interior of the stones is fresh but in some pieces there is evidence for weak oxidation of metal grains. Petrography: (D.D. Badyukov and M.A. Nazarov, Vernad). The majority (2/3) of the stones are composed of a light-colored lithology with a typical chondritic texture. 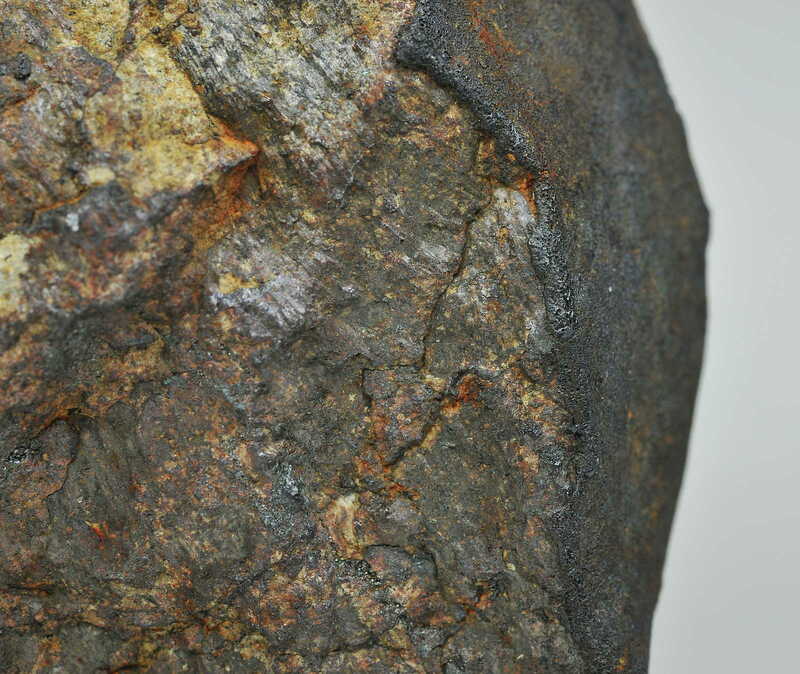 Chondrules (~63%) are readily delineated and set within a fragmental matrix. The mean chondrule diameter is 0.93 mm. The chondrule glass is devitrified. The main phases are olivine and orthopyroxene. Olivine shows mosaicism and planar fractures. Rare grains of augite and clinobronzite are present. Small and rare feldspar grains show undulatory extinction, planar deformation features, and are partly isotropic. Troilite (4 vol.%) and FeNi metal (1.3 vol.%) occur as irregularly shaped grains. Accessory minerals are chromite, ilmenite, and Cl-apatite. 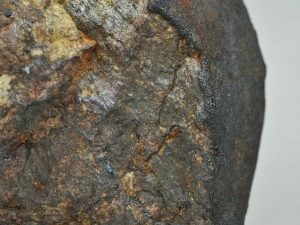 A significant portion (1/3) of the stones consist of a dark, fine-grained impact melt containing mineral and chondrule fragments. Feldspar is well developed and practically isotropic. No high-pressure phases were found in the impact melt. There are black-colored thin shock veins in both light and dark lithologies. Geochemistry: (M.A. Nazarov, N.N. Kononkova, and I.V. Kubrakova, Vernad). Mineral chemistry: Olivine Fa 27.9±0.35, N=22; orthopyroxene Fs22.8±0.8Wo1.30±0.26, N=17; feldspar Ab86; chromite Fe/Fe+Mg=0.90, Cr/Cr+Al=0.85 (at.%). Major element composition of the light lithology (XRF, ICP-AS, wt%): Si=18.3, Ti=0.053, Al=1.12, Cr=0.40, Fe=19.8, Mn=0.26, Ca=1.43, Na=0.74, K=0.11, P=0.10, Ni=1.06, Co=0.046, S=1.7. Atomic ratios of Zn/Mn × 100=1.3, Al/Mn=8.8. The impact melt lithology has almost the same composition but it is distinctly higher in Ni, Zn, Cu, Mo, Cd, W, Re, Pb, Bi (ICP-MS). 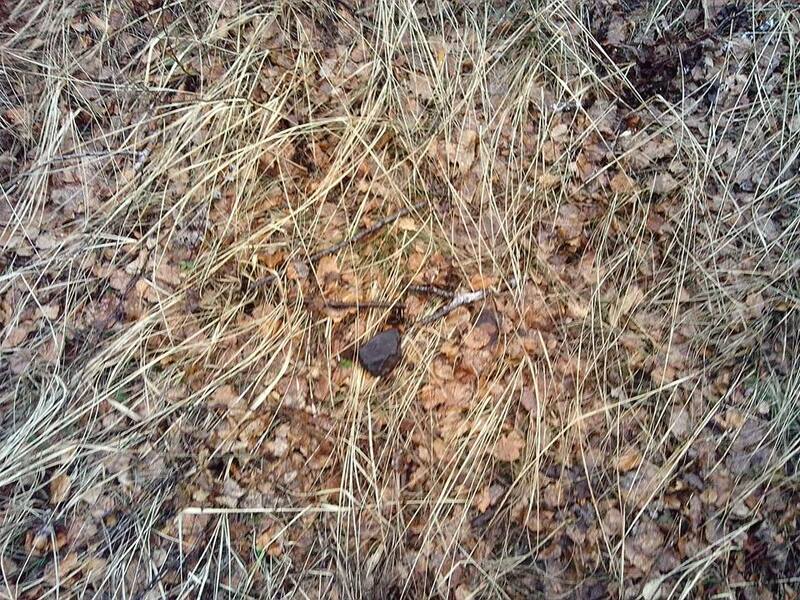 Classification: Ordinary chondrite (LL5), shock stage S4, weathering W0. Specimens: About 400 stones weighing 3.5 kg in total and a few thin sections are in Vernad. The main mass of the Chelyabinsk meteorite fell into Chebarkul lake and broke the ice, forming a 7 m hole (54°57’33.74″N, 60°19’19.58″E). 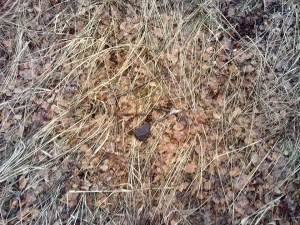 Numerous small fragments (0.5 to 1 g) were scattered around the hole on the snowy ice. 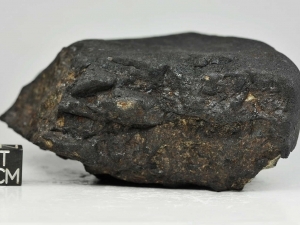 5 kg of meteorite samples were recovered from the lake bottom using magnets during the first month after the meteorite fell. 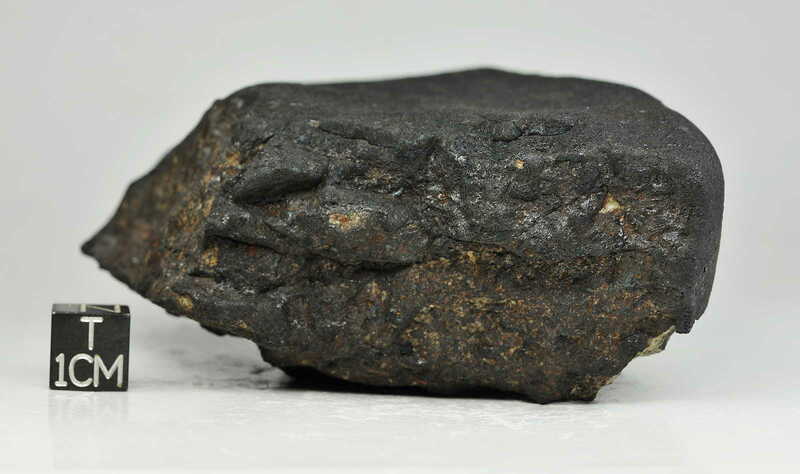 Additionally, ~10 kg of meteorite fragments were recovered by local residents in the same way, but were not well documented. 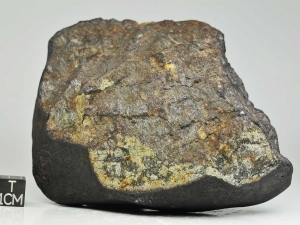 Underwater recovery operations between Sept. 5 and Oct. 16, 2013, retrieved eight additional meteorite fragments: the largest sample weighed ~540 kg, and the other seven fragments totaled 84.4 kg. 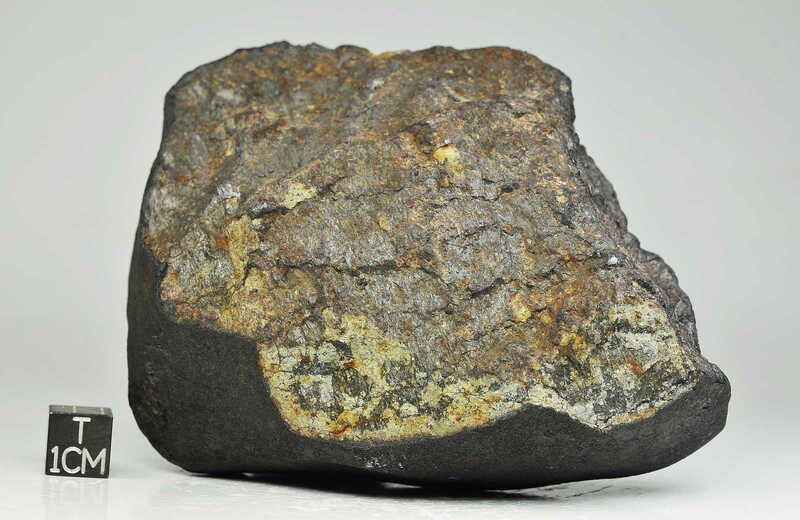 The total mass of meteorite pieces recovered from the bottom of Chebarkul lake was therefore ~640 kg. 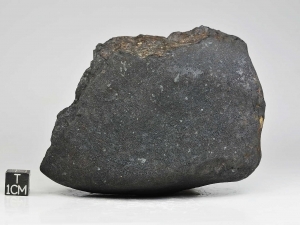 Hence the total estimated mass of Chelyabinsk meteorite fragments recovered from the lake and collected in the strewn field on land is ~1000 kg. Submitted by A. V. Kocherov (Chelyabinsk State University, Chelyabinsk, Russia), M. A. Ivanova (Vernad).